I hope you get this ok. As you know I just returned the monkeys and want to let you know how things went for me out there. I want to thank you for providing me with the opportunity to go, and I can’t recommend it enough for anyone who is interested in primates or wildlife in general. I was made very welcome by Bob, Lynne & Matthew and settled in very quickly. I was involved in all the daily tasks that need to be done to run such a place and learnt much more than I imagined I would. 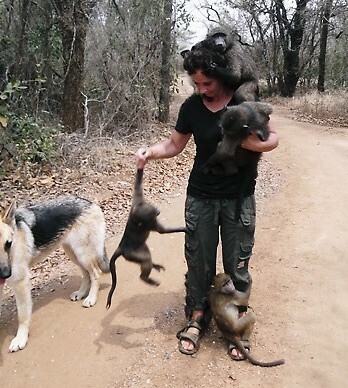 I will really miss my daily walks to the pool with baboons clinging to my legs, round my waist and on my head! Bob and Matthew are extremely knowledgeable about all aspects of wildlife & conservation and you can’t help but be impressed by their passion for the welfare of these animals. They make sure that the volunteers are involved in everything and I even got to assist in the clinic with injured monkeys. I was very lucky to be there for the baboon release and was involved in all stages of that, from building the enclosure in the conservation site chosen for their new home through to processing the animals for transportation there which entailed them being sedated, weighed, measured, micro-chipped and placed in transportation crates and taken to the release site. I was involved in monitoring their behaviour, eating patterns etc for the following fortnight and it was fascinating to see how well they adapted to their new environment. It really was amazing to see these animals being released and I feel very privileged to have been part of it. The whole thing was filmed by National Geographic so I even got to see behind the scenes of documentary making. The trips available to the volunteers are very good especially the Kruger Park trip. Matthew was a fantastic guide and there was’nt an animal or bird that he did’nt have knowledge of. The work that is done there is so important and they rely on volunteers for help both financially and practically so I hope that you manage to send lots more out there. To sum up I had an amazing experience and would definetely go back there if circumstances allow and the only advice I can give to anyone interested in primates is to go out there and experience it for themselves. Thanks again for all your help and I wish you every success for the future. To find out more about this project, check out our primate volunteering in South Africa web page. Previous Post Oyster review: what is it really like to volunteer in Brazil?